Well, Back from a holiday break. We went to visit the granddaughter in Rochester, NY. I did take 2 days off before Christmas to sew a snow white dress. But now back to the project: First, I photographed the figures on black and gray backgrounds to decide which I liked better. For all but the disco balls, I preferred the gray. 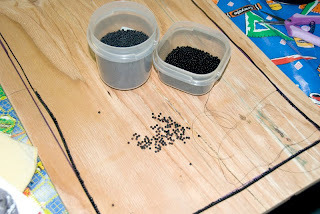 I stitched 2 rows of round #6 seed beads in black and very dark brown around the entire wire frame. I like the depth that close but not identical shades provide. I decided to up the weight of the thread to 10 lb fireline as the bead holes allowed it and I figured, the heavier the better. 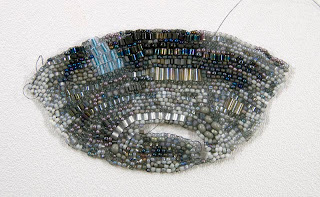 After the 2 rows of round beads, I added a row of dark iridescent rectangular beads, followed by a row of bluish gray rectangular beads. 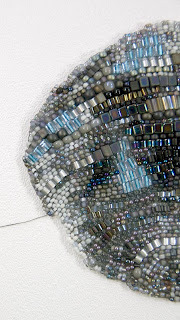 I think that the rectangular beads will add rigidity to the frame and the gray will help shade the frame into the proposed gray background. 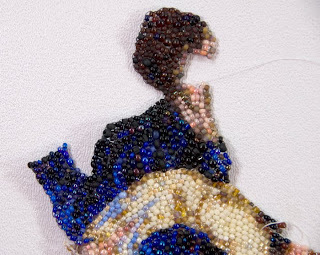 As I bead around, I attach any figure that butts the frame. I have decided to leave the upper left corner to last. 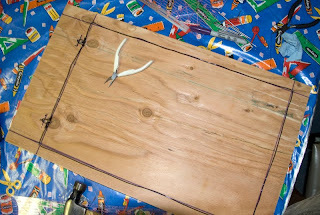 This is where I planned the speakeasy door with the eye hole. I am debating leaving this feature out as I am concerned with getting the background too busy as well as adding a detail too small (the eye in the hole) to carry down to the reduced playing card size. 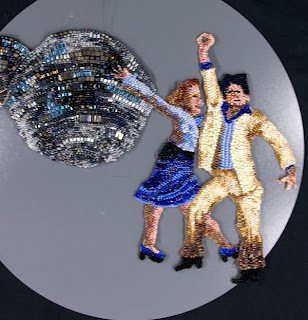 Another decision is what stitch in which to actually do the background. Brick stitch will be more stiff but add lines to the background. 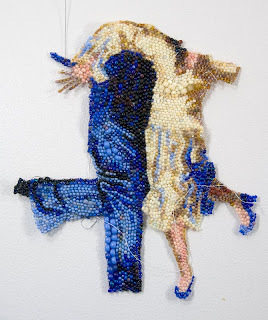 I like to surround my brick stitch figures in a background of right angle weave as there are no distracting line of beads in right angle weave. 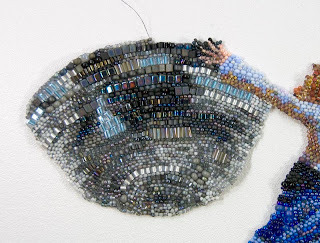 However, right angle weave is a softer stitch, it will not be as stiff a supporting structure. 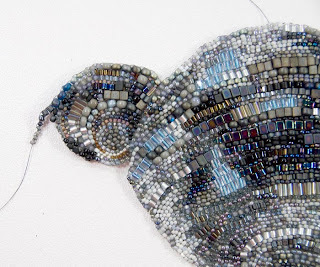 Right angle weave also takes longer to stitch than brick stitch. 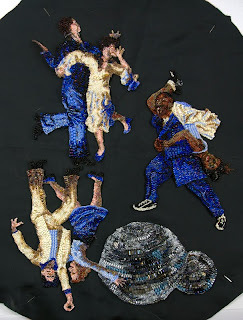 I have chosen to do the lines of the dance floor in brick stitch and the surrounding background in right angle weave. 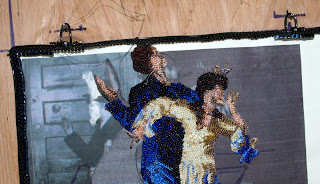 I think that the dance floor lines will add sufficient support especially if done with rectangle beads. 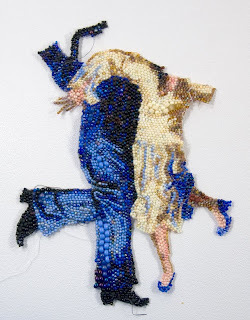 I am sampling some of the brick stitch lines representing the dance floor. I may or may not decide to keep these. 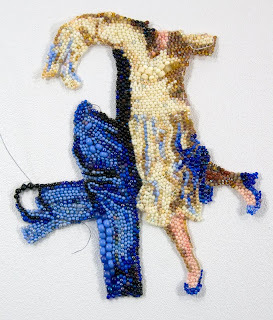 I do like the blue and gray, but like the gold-brassy beads less. I am concerned they might draw attention too much away from the figures. I will wait and delay my decision till more is stitched. 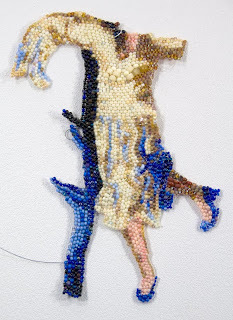 When I first started to do brick stitch pictures, I worked from the figures out to the edge. I found it very difficult to end up with straight edges. 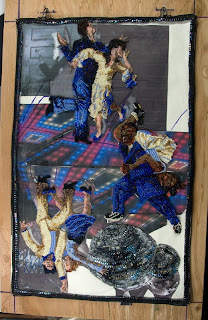 Since this particular project has a required finished size, I am going to establish the outside edge first then work the background to tie the figures into the already set frame. 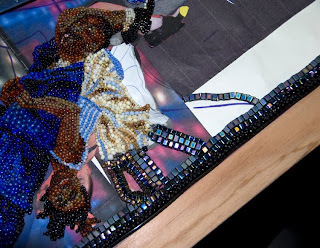 Because of the size, I feel that this beadwork will require some support, so I am going to wire the outside edge. 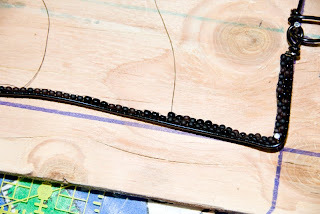 I chose 16 gauge black colored artistic wire. 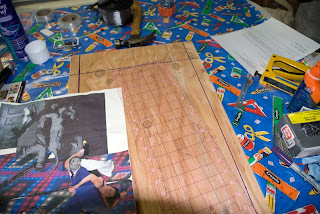 First, I sawed a board a little bigger than the 12"x19" finished project size and drew with marker and ruler the 12"x19" rectangle on the board. I drilled small holes just inside the corners as well as 2" in from the top edge and hammered finishing nails into these holes. 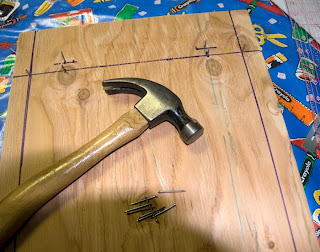 I added nails for hanger loops at the top above the extra nails. 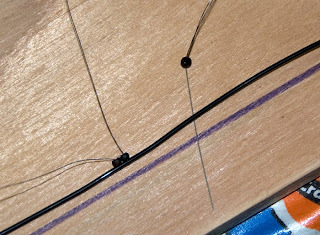 I looped the wire around the nail 2" in from the top corner and wound the wire around the bottom nails and the other top corner to the nail 2" in from that edge. 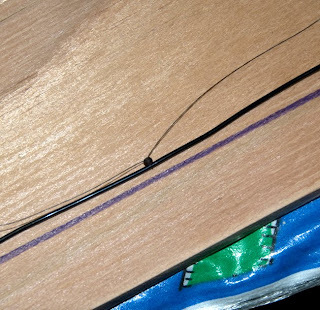 The wire was cut and looped off. 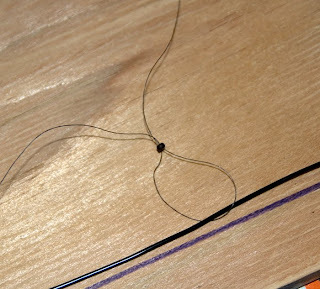 I threaded a second piece of wire through the two top wire loops, wrapped over the nails above the piece and refastened to itself. 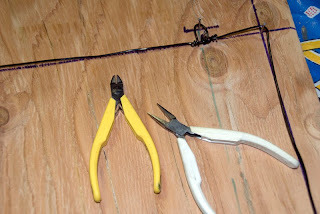 I am not an expert wire wrapper but did not want an asymmetrical fastening of the wire. This was my solution. 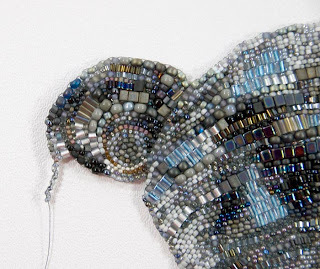 I then brick stitched size 6 beads around the wire by picking up a bead, putting the needle around the wire and going back through the bead. 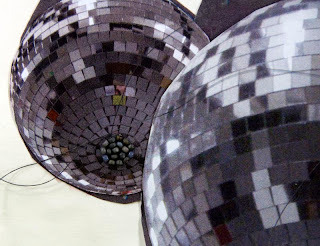 The second, smaller disco ball has a different orientation showing the bottom of the ball. 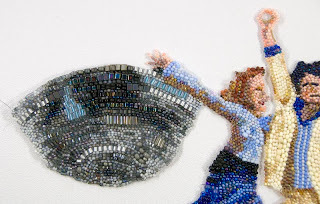 I choose to start with a circular bead ladder at this bottom circle. 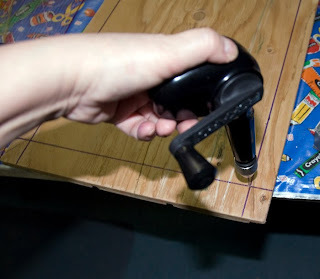 After a few rounds, the smaller ball is attached to the side of the first and larger one. 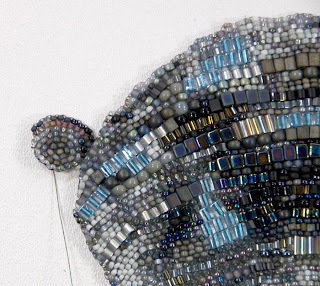 Rounds of brick stitch continue with smaller beads on the bottom and larger beads on the top. 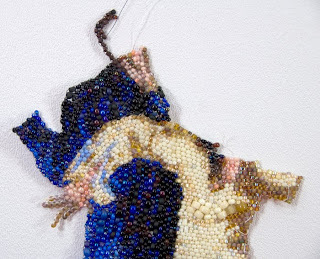 When the bottom edge is neared, a bead ladder is thrown to outline this edge, then filled in. 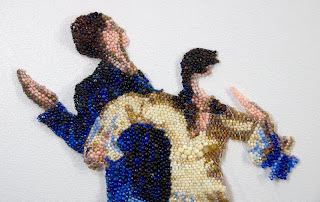 As before, bead ladders in new areas are done in small increments. 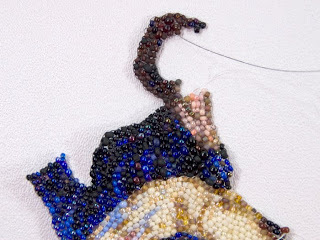 It is much easier to control the shape of a short bead ladder than a long one. 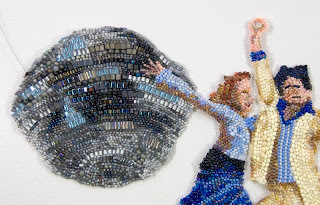 The original collage was made with disco balls that were photos of pictures. I was never quite satisfied with them. 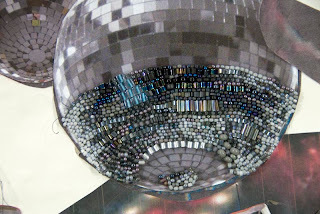 I searched until I found a real disco ball that I could photograph and do so in several orientations. 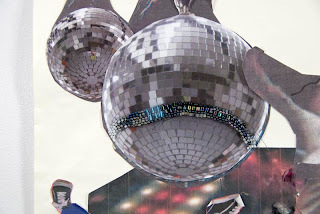 I am much happier with these new photos so have pasted them over the original disco balls. 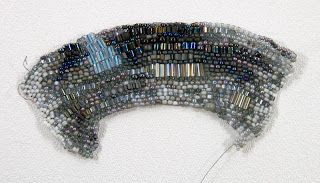 To begin the beadwork, I chose a line in the photo to make as my first bead ladder. It happens to be in the lower middle of the ball. 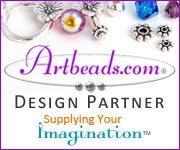 And remember, I do not do a bead ladder the length of the line, I do the bead ladder in 1"-2" stages, curving the line by increasing, decreasing, and bead size changes in the second and third rows. 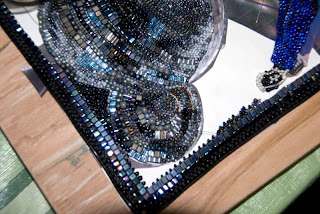 I decided to add bugles and rectangular beads to add to the mirrored tile effect of the disco ball. I am using 8 lb fireline as a thread. 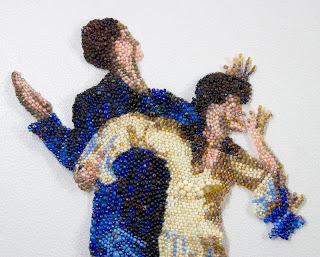 The largest beads will be in the center, belly, of the ball to attempt to add dimension. 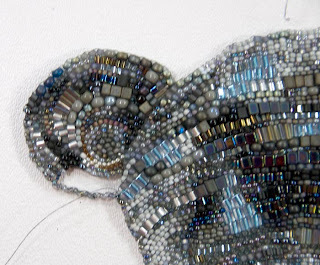 As the beadwork progressed, I shaped the curving lines by tapering the edges with 2 and 3 drop brick stitch (that is adding 2 or 3 beads at a time in a single stitch). 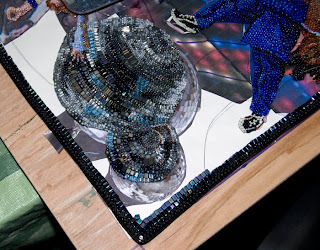 When I came near the bottom, I stopped and restarted at the bottom and then worked up, attaching the two pieces. 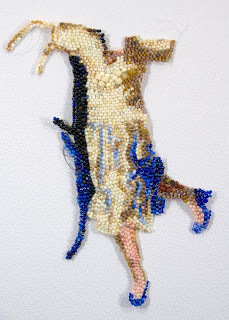 I then went back to the original line and added beads on the other side working upwards and incorporating the arm of the female disco dancer. 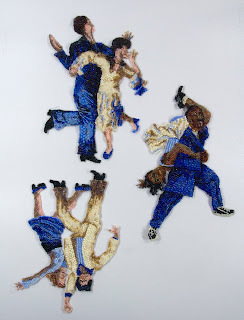 I have now completed all 3 nightclub dancing couples. 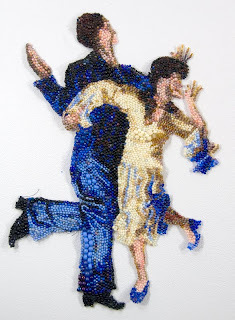 I am entranced by the gestural expression that can be achieved by brick stitch beadwork. I am not a grid person. 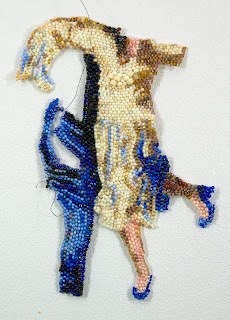 I have seen wonderful work done in peyote and loomed beadwork that has been beautifully gridded, but I prefer the freedom to stitch in whatever direction I choose and to use the varying direction of bead rows as a part of the design. 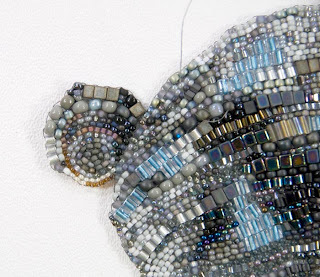 In addition, freely changing bead shapes and sizes can be used to emphasize certain areas over others and give a better impression of what is in front and what is behind. 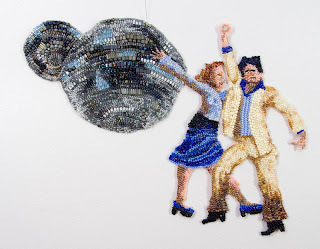 Note that since the end result is to be photographed as a playing card, The disco couple is upside down. 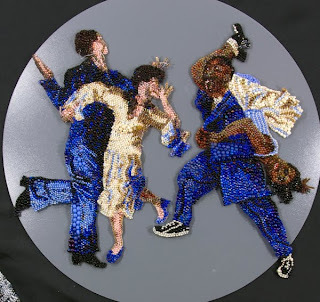 The Charleston Couple is completed by adding the hands and faces. 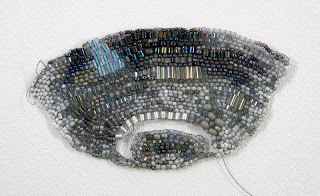 When constructing the first bead ladder of a new area, I often do not choose an outer edge but instead choose a prominent inner line. There is little room for detail in the hand sand faces, so jaw lines and cheek shading must convey the essence of the face, especially in this couple who are facing away so that features are not apparent. 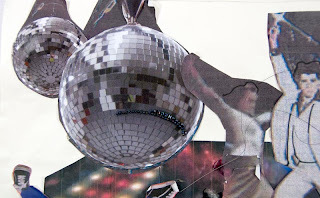 More important than detail is the feeling of the motion of the dance and the fun of the nightclubbing experience that is the essence of my interpretation of the 6 of clubs. Since the dark areas of the woman and man blend together, I felt it best to stop working on the woman and begin the man's figure so that the blending of the heads could be done together. 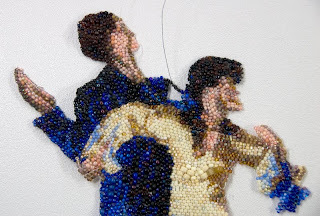 To begin the male figure, I started vertical rows of beads against the side of the female body. 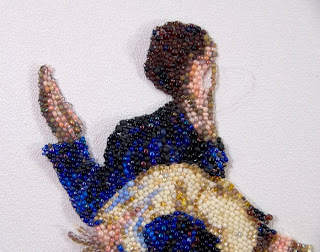 I then threw bead ladders in black to mark the creases in the man's pants. 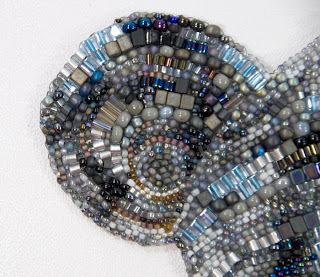 The pants were then filled in choosing the direction of the bead rows to follow the drape of the clothing fabric. The woman's hand was added and the man's shirt worked up to the woman's arm. 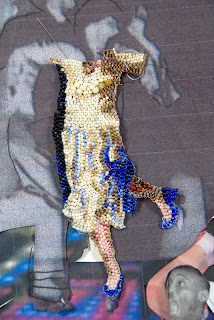 The man's legs and shoes were completed and arm and shoulder begun.